The Young Master gained compensation for his dramatic disqualification after 'winning' at Wincanton with a fine display in the Mappin & Webb Silver Cup Handicap Chase at Ascot. Neil Mulholland's five-year-old had last been seen passing the post first in the Badger Ales Trophy, only to have the race taken away from him as it emerged he had not met the qualifying criteria for the race. Despite that he had still been raised 14lb by the handicapper, but he travelled well for much of the three-mile journey under Barry Geraghty, although occasionally jumping out to his left, and was sent clear running to the second-last. Stretching his advantage to the final fence, he safely negotiated that to run out a ready two-and-a-half-length scorer from Houblon Des Obeaux, picking up a first prize of £56,270. Geraghty said: "He's only five and he runs about a bit in front, but Ascot is a daunting place. "He's done really well and Neil has done a brilliant job with him. It was hard luck the last day and he got a 14lb penalty. It was a good performance and he's progressing well." Mulholland added: "It's great for the owner and for the horse. It's just great after what happened, for the owner and the yard. The lads felt it, too. It was a big mistake. "The horse always knew he won at Wincanton but the owner felt the pinch more. But today will be a big help. "You have to look forward. If you train three winners this week, people want to know what you are going to do next week. That's what it is all about, really. "We always knew he was a nice horse and we thought he would improve from Wincanton and he's only five, so hopefully there will be a little bit more improvement to come. We bought him as a two-year-old and he was just broken. "Mike Burbidge, who is a very good supporter of mine, knows I wanted to train a few more Flat horses, because at the end of the day it is a business and we've got to try and keep our stables full 12 month of the year. This lad is bred for six furlongs, so you could say he is a bit of a freak. "It is always easy to be confident after they do it, but he's always kept improving - he's like Midnight Chase, who also kept improving for us. I was more confident coming into today than I was going into the Badger Ale, but we felt he improved from that." 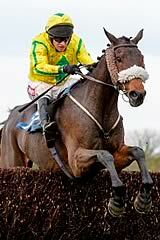 Asked about the Cheltenham Gold Cup, he said: "He's only a five-year-old. Maybe next year if he keeps improving. He won off 144 today, and Barry was very happy with him. We didn't speak much after the race, but we will have to look and see where we go from here. "This race was mapped out four weeks ago and thankfully it paid off."